I wasn’t quite sure what to expect from The Flavour Principle but I've decided it's a keeper. 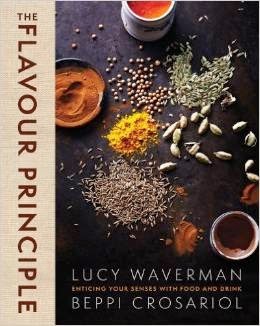 Each chapter has a different flavor profile—bitter, herbal, smokey, eatery, sweet, spicy etc. The first page of each chapter has a list of ingredients that typify the flavor so for example next to earthy you get potatoes, beets, mushrooms, eggplant, black beans, truffles, leeks, bison, etc giving you a preview of the recipes. There are drink recipes and full menus that emphasize the flavor. The menus each have a theme like Sophisticated Vegetarian Dinner, An Argentinian Odyssey or Icewine Extravaganza. Yup, this is a Canadian book and the authors are the weekly food columnist and wine and sports columnist for The Globe and Mail. 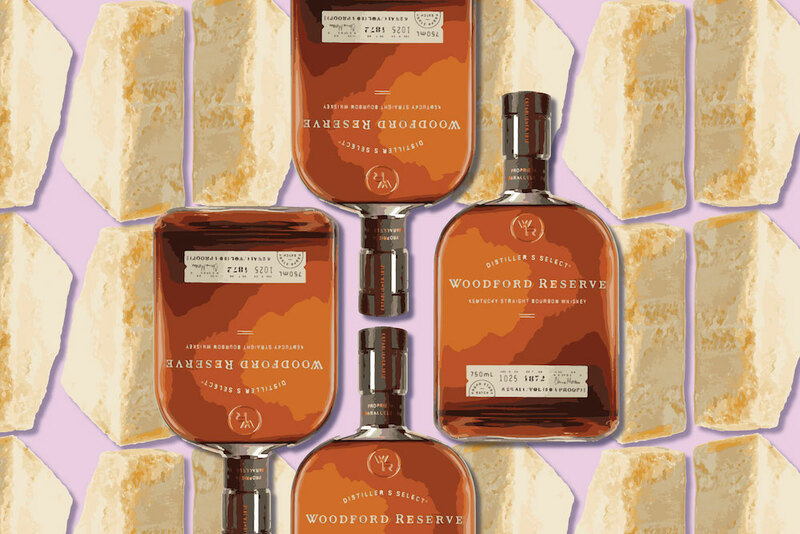 There are also drink pairings for most of the dishes and a discussion as to why it pairs well. There are lots of added features such as how how to flame an orange peel, glassware 101, a primer on different kinds of curry (Indian, Thai, Malaysian and West Indian) and how to compose a cheese plate. The book is well over 450 pages so there is no skimping on information, discussions of wines and cocktails or photographs. The recipes are great, but I think it’s also a wonderful reference book because of the wine pairings and flavor profiling. Some sample recipes? Watermelon Gazpacho, Shaved Cauliflower and Swiss Chard Curry, Sweet Spicy Garlic Chicken, Tea Smoked Salmon, Hazelnut Meringue Roulade, Caramel Pecan Popcorn. 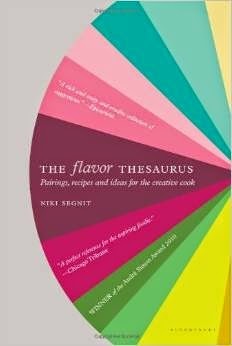 After reading about The Flavor Thesaurus on Dianne Jacob’s blog, I immediately purchased a copy for myself. It’s not a traditional cookbook, nor is it really a thesaurus. The book begins with a flavor wheel, it outlines flavors much like The Flavour Principle does—for example Earthy lists mushrooms, eggplant, cumin, beet, potato and celery. Then in the Earthy chapter there are listings for each of those ingredients. The listing pairs the ingredients with other ingredients. So for example with eggplant you get an introduction to the ingredient then listings for eggplant & bell pepper, eggplant & chili, eggplant & garlic, eggplant & ginger, eggplant & lamb, eggplant & nutmeg, eggplant & prosciutto, eggplant & soft cheese, eggplant & tomato and eggplant & walnuts.These are interesting pairings but perhaps not as groundbreaking as I was hoping. Of course some chapters do have more unusual pairings such as rhubarb & cucumber or goat cheese & chocolate. With some of the pairings there are recipes written in an informal way, but not as a general rule. The book reads like someone’s kitchen notebook with lots of trivial about ingredients and recipes. It’s not as useful as The Flavor Bible, but it’s an interesting book nonetheless. 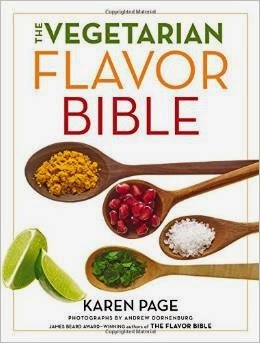 The Vegetarian Flavor Bible is a follow up to The Flavor Bible, a book I use frequently when creating recipes, so I was excited to learn that Karen Page and Andrew Dornenberg were publishing a vegetarian version. If you grew up like I did, eating vegetables steamed and plain, this book will be a revelation. It takes hundreds of vegetarian ingredients and outlines the season they are available, their flavor, their volume, their nutritional profile and calories, techniques used to prepare them, tips and botanical relatives. Then comes the fun part, a list of ingredients that they pair well with, some notable dishes from restaurants using the ingredient and “flavor affinities” that combine 3 or more ingredients. There are also some great quotes from and interviews with chefs and some surprises too like seasonal guides and information on some crucial vegetarian cooking tools like the Vitamix and spiralizer and the primary ingredients of different cuisines. If you want to create your own recipes using vegetarian ingredients this book is simply a must have. 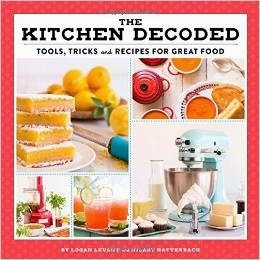 The Kitchen Decoded is organized by cookware, tools and appliances and is intended to help less experienced cooks figure out how to use that KitchenAid mixer or what too cook in a Le Creuset dutch oven. Those brand names and several others feature prominently in the book. It’s got a lot of really solid basic recipes that frankly, you can probably find elsewhere with the exception of the baked goods. There are recipes for things like Black Bean Patties, Mussels with Sausage, Guacamole, Whole Roasted Chicken and Coconut Rice but since one of the authors was a bakery owner, you’ll also find about a dozen Buttercake Bakery recipes for things like pecan snowball cookies, brownies, cheesecake, and coffeecake. This book would be particularly good for someone setting up a kitchen or registering for wedding gifts and is wondering how they will use some tools. But I do disagree with the usage of some appliances, for example I’m not convinced you need a food processor to combine the lime juice, jalapeño, garlic, tomato, onion and cilantro for guacamole, likewise I wouldn’t bother using a food processor for making biscuits.